Plans unveiled Wednesday outline a new sports and entertainment arena off the Strip, a facility to be built without taxpayer dollars jointly by Harrah’s Entertainment and AEG, the biggest worldwide player in sports facilities and events. The $500 million arena is to be built about a block off the Strip behind Bally’s and Paris Las Vegas, officials for Harrah’s and Los Angeles-based Anschutz Entertainment Group said during a news conference at Bally’s. The 20,000-seat arena to be built on 10 acres owned by Harrah’s will be funded privately by both companies. In a joint venture, AEG will develop, build and manage the arena for Harrah’s. "I’m 100 percent for being in a position where taxpayers are not at risk," AEG Chief Executive Officer and President Tim Leiweke said. "Harrah’s presented us with the best opportunity." AEG and Harrah’s said they have funding for the project and will not have to rely on the volatile credit market. "We have never announced a deal and not built," Leiweke said. "We’ll save our bluffing for the tables downstairs." 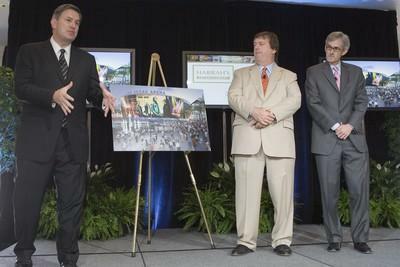 The announcement was made by Leiweke, Harrah’s Chairman and CEO Gary Loveman and Clark County Commission Chairman Rory Reid. Reid said it was important that the arena be developed privately while addressing the issue of the 24-year-old Thomas & Mack Center and other older venues. "Las Vegas has always been able to compete as the entertainment mecca of the world," Reid said. "To continue, we need a new and superior arena." Leiweke said he hopes the arena could lure a team from both leagues, much like Staples Center, which has the NBA’s Lakers and Clippers and the NHL’s Kings. AEG built and operates Staples Centers. 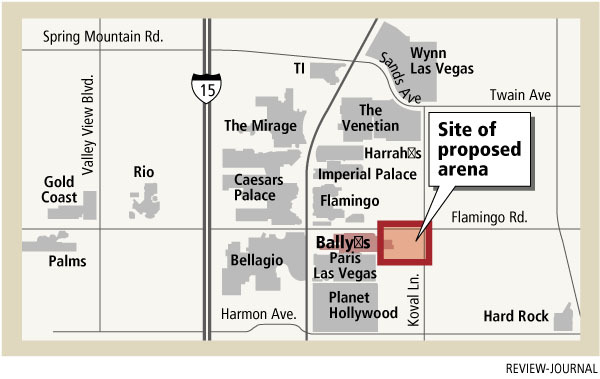 The site for the arena is part of 34.5 undeveloped acres along Koval Lane from Flamingo Road to Harmon Avenue that Harrah’s had assembled for future development. Pat Christenson, arena task force chairman and president of Las Vegas Events, said he was pleased by Harrah’s and AEG’s announcement, especially because no tax dollars will be used in the construction and operation. "I don’t know how it could be any better," Christenson said. 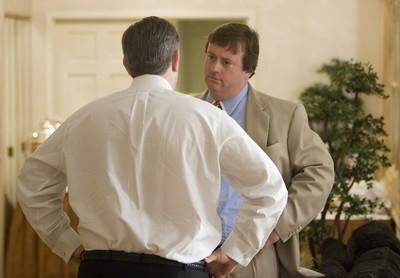 "You have the top sports and events producer in the world." "I spoke to Mr. (REI Group President) John Weaver this morning, and it’s business as usual," Goodman said. Leiweke said he talked to various developers, including other gaming companies, before deciding to partner with Harrah’s. "If this arena was built too far from the Strip, if it’s not within walking distance of the major developments and hotel rooms, quite frankly we would have missed the opportunity," Leiweke said. The announcement comes with Harrah’s in the middle of getting regulatory approval of a $17.1 billion buyout by private equity firms Texas Pacific Group and Apollo Management. Harrah’s Entertainment stock increased 52 cents, up 0.61 percent, to close at $85.55 Wednesday on the New York Stock Exchange.